After yesterday’s excitement of Star Wars Day (May the fourth be with you) it seems fitting for one last headline pun as we end the week on the 5th and highlight a classic example of fundamental economics as supply casts its revenge upon prices in lamb markets, particularly in the West. As pointed out in last week’s commentary, we needed to wait to see what developed with regard to supply post the Easter and ANZAC shortened periods to get a clearer gauge of the market sentiment at the moment. Clearly the rebound in lamb supply experienced this week has placed a bit of a dampener on price activity, but it may not last. 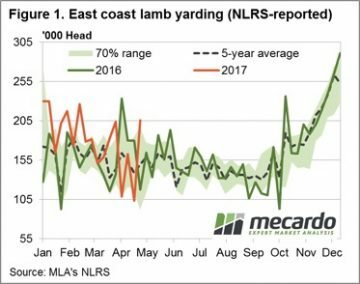 Figure 1 highlights the lift in east coast lamb yardings as saleyards return to normality this week with a near 100% gain in throughput recorded to see just over 205,000 head of lamb change hands. Interestingly, the post Easter recovery in lamb yarding seen this season still over 25,000 head short of the 2016 peak of around 233,000 head, suggesting that the incentive to retain stock is strong despite the high prices on offer. 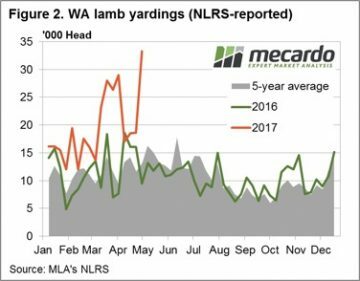 A different story in the West though with solid prices enough to draw out supply as the pattern of lamb yarding in WA shows so far this season tracking well above the five-year average pattern and the 2016 trend – figure 2. Prices in the West responding in an anticipated to the 78% jump in lamb yardings on the week, fashion according to the laws of economics, with the WA Trade Lamb Indicator (WATLI) down 7.5% to 596¢/kg cwt. The elevated east coast lamb yardings having an impact on the Eastern States Trade Lamb Indicator (ESTLI) too, albeit to a lesser degree than out West, with a slight fall of 1.7% recorded on the week to see it close yesterday at 634¢/kg cwt. Despite the rebound in supply noted this week, broadly speaking prices remain fairly robust – certainly for lamb and are even more well supported for mutton. The generally lower levels of throughput and slaughter we have experienced for much of the season continue to underline the tight supply being experienced at the moment and the comfort producers are displaying in holding back supply in the face of good historic price levels bodes well for the coming weeks and months ahead. As the Mecardo lamb forecast pointed out in articles released late in 2016 the stage is set for an ESTLI of at least 750¢ come late-Winter and may even spike towards 780-800¢ if the A$ can continue to soften, supply remains tight and producers can hold their nerve.